The Goodfellowship Club was established in 1901 to provide employees of the Vassar housekeeping department with social, recreational and academic opportunities. In the spring of 1901 a group of Vassar students representing the College Settlements Association, a service and education program for the urban poor started in 1887 by a small group of Smith alumnae and quickly adopted at Vassar, Bryn Mawr, Wellesley and other colleges, sought to provide the Vassar maids with an on-campus facility in which to rest, socialize, and learn. The association petitioned the executive committee of the board of trustees for permission to build a Maids' Club House. In the spring of 1903 the association organized the Good Fellowship Club (later the Goodfellowship Club) to help the maids develop skills for self-governance in their club house. With some reluctance, the trustees granted permission to build the club house in June of 1903, and construction began promptly, funded by $10,000 the Association had raised, with assistance from alumnae. 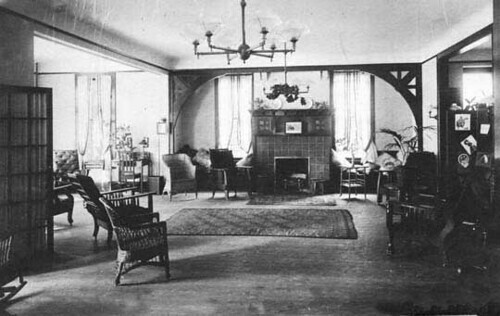 When the stucco bungalow, designed by Professor of Art, Lewis Pilcher, opened, in March 1908, it included a kitchen and laundry room in the basement, a dining room, circulating library and large living room with a fireplace and piano on the first floor, and two infirmary rooms on the second floor. A committee of six students directed activities at the club house, and the college employed Miss Grace Elisabeth Paine, a trained social worker from a settlement house in Philadelphia, to reside in the house as supervisor. The club itself was nominally self-governing with its own president, secretary, treasurer, one elected vice president from each residence hall, and one from the laundry. The officers formed an executive board and membership committee who cooperated with the supervisor and the student committee to plan activities and events. Membership was not compulsory for the housekeeping staff; club members had to pay dues, but non-members could still use the library and laundry facilities. The club offered recreational and social activities as well as academic, cultural and domestic training, declaring that its purpose was to provide "a place of recreation and a place of opportunity for all maids." Events included parties for club members and their families about once a month and Sunday services every week. Members could receive and entertain male guests in the house so long as a chaperone was present. Club members attended classes in drawing, music, basketry, dancing, typing, sewing, cooking, nursing, English, history, algebra, geometry and physics. Vassar students taught most of these classes and arranged faculty lectures especially for club members. Members staged plays, recitals and minstrel shows to fund the club's activities as well as the furnishing and upkeep of the house. At Thanksgiving they prepared baskets for the Poughkeepsie poor and on Easter sent flowers to hospitals and the homes of the elderly. The club benefited the Vassar students as well as the maids, introducing the former to philanthropic skills and social concerns deemed appropriate for women of that era. Ruth Cutler, Student Committee Chairman in 1911, described the Club House as a "training centre" for students who could acquire skills "which may later prove of use to them in other social activities." The club also softened the lines of class and gender. 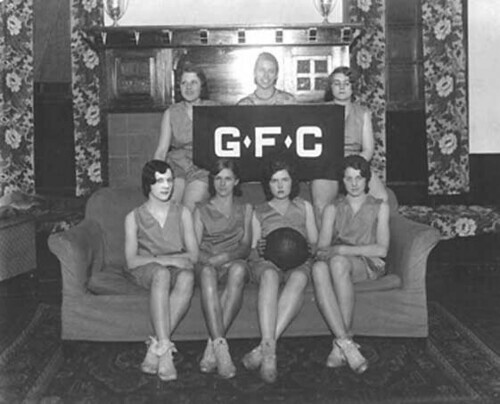 Students and staff joined as members of athletic teams, and, originally intended to serve the female maids, by the 1920's the club welcomed all employees of the housekeeping department. The first male membership was recorded in October of 1922, and in 1925 the club converted one of the rooms into a billiard room for the male members' exclusive use. The men also formed a basketball team that sometimes used the college gymnasium. At a time when the rare male faculty member appeared in college dramatic productions and when many male roles were played by female students, men and women, staff and students performed more equally in the club's productions. From 1920 to 1949 the club's own journal, The Club House News, reported on and publicized events and activities, and included members' poetry. The club began exercising greater executive power in 1922 when it composed a constitution, together with a council that took charge of the club's funds and business transactions and made and enforced house rules. In 1925 the club council and student committee decided that the council would take responsibility for initiating and directing activities, relegating the student committee to an advisory role, though the Supervisor continued to exercise "final authority." The club eventually disintegrated in the 1940's when college workers became unionized. For many years, the Club House was used occasionally for union meetings and as a union gathering place, and in 1995, restored and reconceived by architect Linda Yowell '73, it reopened as the Carol and James Kautz Admissions House. I ironed and waited table and the next year  I worked in the bundle room. You know the bundle room was where the students' clothes went after they were washed and you bundled them up and delivered them around to the rooms. There were four girls in the bundle room . . . The first year I roomed in Main building and the next year, when I went back, over to the laundry. . . I worked there for three years. We had a wonderful time. You were allowed two nights a week out. You had to write your name on the book at night. Ms. Ashmead was assistant housekeeper and she would come out with a book and sit at the table and the girls would write the names . . .You had to be in by ten and then go up to Ms. Graham's door, she was the head housekeeper, and let her know that you were in. I had to wait tables on Sunday . . . Eight students sat at the table. The meat was served and then the vegetables were served family style. You all were in the kitchen and you had your soup to eat, but you waited for five minutes for silent prayer. There was a gong sounded in the dining room, the [principal] sat at the end table. . . She would have a gong, she'd strike it . . . and then everybody was quiet, even the ones in the kitchen . . . and then you would go in and serve the soup. I think, if I can remember right, there were two kinds of meat, and you took the order for meat and what they wanted to drink . . . And you know, everything was so family-like don't you know, everyone was so agreeable. "History of the Maids Club House," Box 1, Folder 3, Goodfellowship Club papers, Vassar College Special Collections (VCSC). Sarah Hinks, "The Club House," Feb. 1, 1909, Vassar College, Poughkeepsie, NY—item in "The History of the Maid's Club House," Box 1, Folder 3, Goodfellowship Club papers, VCSC. Evelyn Noble, "The Maids' Club House," May 1913, Vassar College, Poughkeepsie, NY—item in "The History of the Maid's Club House," Box 1, Folder 3, Goodfellowship Club papers, VCSC. Cutler, Ruth, "The Maids Club House," March 1911, Vassar College, Poughkeepsie, NY item in "The History of the Maids' Club House," Box 1, Folder 3, Goodfellowship Club papers, VCSC. Good Fellowship Club Meeting minutes, October 12, 1922, Box 1, Folder 1, Goodfellowship Club papers, VCSC. "Rules for the Pool Room: 1929-30"; "Men's basketball regulations," both in Box 1, Folder 1, Goodfellowship Club papers, VCSC. Records of the Club House News. Box 13 of Goodfellowship Papers, VCSC. Constitution of Goodfellowship Club, Box 1, Folder 1 of Goodfellowship Papers, VCSC. Good Fellowship Club Council meeting minutes, Feb. 9, 1925,Jan. 14 1929, Box 1, Folder 1, Goodfellowship papers, VCSC. Mae Gessner, Interview by Elizabeth A. Daniels, Tape 44 in VCSC.